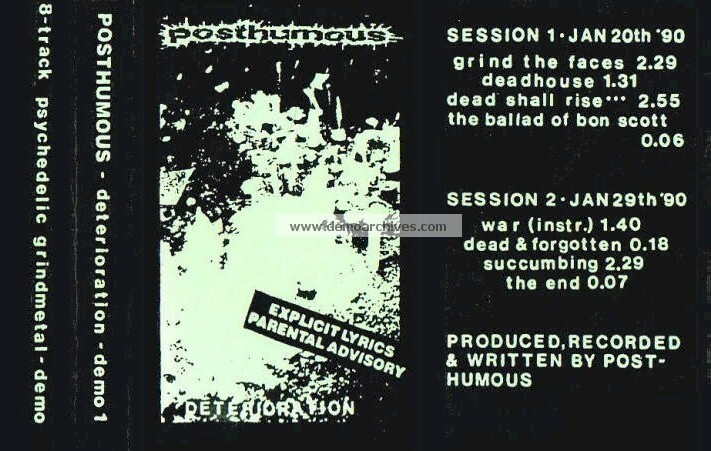 Dutch underground Grindcore act POSTHUMOUS, created in 1989, released the 1990 demo 'Deterioration'. The band slipped into dormancy, but re-awoke in 2000 with the re-release of the self-financed remastered 'Deterioration' on CD. Sold 500 copies, 8 tracks, 12 minutes, no lyrics. Xeroxed cover on green paper. Remastered in 2000, re-released on CD-R.